CHINO HILLS, Calif. — Hundreds cheered as a California school board voted on Monday on which law firm they would hire to represent them in an appeal against an atheist lawsuit that resulted in a court order that the board stop praying before meetings and speaking about Christianity in their remarks. As previously reported, in November 2014, the Wisconsin-based Freedom from Religion Foundation (FFRF) filed a 49-page lawsuit against the Chino Valley Unified School District Board of Education. The organization took issue with the board’s practice of opening meetings with invocations, which they argued is a violation of the First Amendment in the U.S. Constitution. The Pacific Justice Institute (PJI), a non-profit organization committed to defending religious freedom, stood with the Chino school board and defended the prayers in court. PJI President Brad Dacus said “some of the board members are very committed to their faith” and argued that their religious freedoms were protected by law. “In a free society we can’t have freedom from religion but freedom of religion, and that’s what this lawsuit’s all about,” Dacus told One News Now. 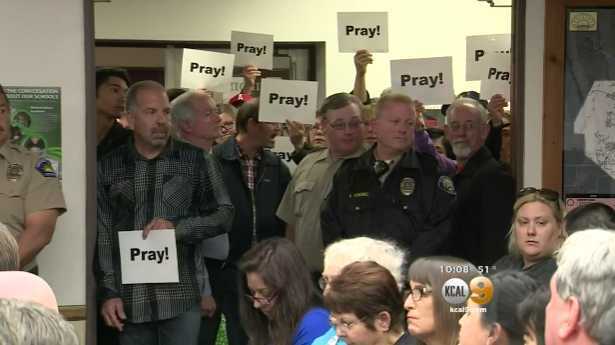 “[M]embers of the Chino Valley Unified School District Board of Education … are hereby enjoined from conducting, permitting or otherwise endorsing school-sponsored prayer in board meetings,” Bernal ordered. Last Thursday, the board voted 3-2 to appeal the ruling, a move that FFRF noted could be costly. Some spoke before the board. Board member James Na expressed his thankfulness for the community support. “I want to say I appreciate each of you being here and standing up for righteousness,” he said. As the board voted 3-2 on its selection of a law firm in moving forward with the appeal, the crowd burst into cheers.